Freeman E Juice is, by far and away, one of the coolest vape juice companies on the planet. From its branding to its pricing, everything about Freeman E Juice is designed with vapers in mind. They do a TON of flavors, from my of the all-time greatest RY4 blends to sweet and dessert-based mixes. Basically, whatever you’re into, they got something you’ll like. And if that wasn’t enough to whet your whistle, we got an exclusive 30% discount code for them as well. This will net you some MASSIVE savings, especially if you’re buying in bulk – 30% is a huge saving, especially when you consider you’re getting 120ML bottles for less than 20 bucks! E Juice quality is important. You’re breathing it into your lungs, so you kinda need it to be high-quality stuff, made by people that actually care. Unfortunately, it is very hard to know exactly what you’re getting when you buy E Juice, especially if you’re buying online via places like eBay and similar online retailer portals. Sure, you might save some money, but if you are vaping noxious stuff from China that’s not exactly something to be proud of. What About Premium E Juice Then? If you can afford it, premium E Juice is great. But not everybody can afford to spend $30 a month on premium vape juice – especially if you vape a lot. It soon adds up. I get to test a lot of premium vape juice, but whenever I buy my own E Juice I tend to go with quality and value for money. And in this context, Freeman E Juice is kinda unbeatable. 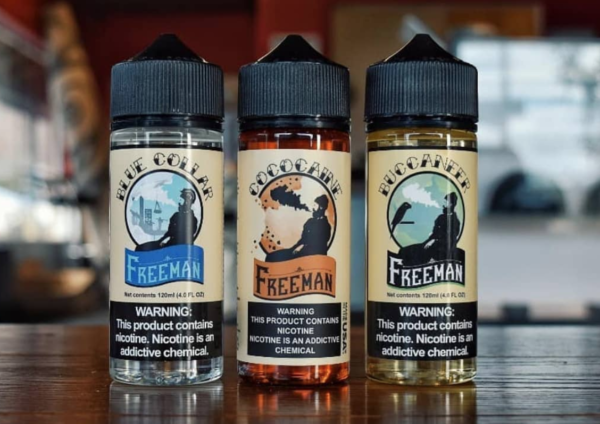 You can get similarly priced E Juice from other brands in the same size bottles, but they all lack the quality of Freeman’s range which tastes great from top to bottom. I’ve tried all of its flavors and I loved 99.9% of them. As noted earlier, it makes my all-time favorite RY4 (a tobacco caramel blend) called Trail Blazer. It also does a stunning range of dessert and fruit-based E Juice. And because all of its vape juices are pre-steeped, the flavors pop right out the bottle. Chuck in the fact that Freeman doesn’t use any artificial colors or additives and you’re looking at some of the best tasting, best quality E Juice around. How they retail it for just $19.99 (120ML) or $8.99 (30ml), I have no idea. Freeman E Juice prides itself on creating the highest quality E Juice it possibly can. It does this using technology and certified chemists to create its products. All bottles are hermetically sealed and each bottle’s nicotine content is 99.5% accurate – way above the industry standard. Each flavor is created in a such a way that ALL flavors are exactly the same, so if you order one bottle in May it will taste exactly the same when you reorder another June. And everything is made in HUGE batches – this is why the cost per bottle is so low. Steeping E Juice is important. It brings out all the flavor notes, so you get the maximum flavor possible. Not all E Juice is steeped, however, meaning you have to do it in order to unlock its full potential. All Freeman E Juice is pre-steeped, so the flavor is on point as soon as it leaves the factory. This means you can open up the bottle and vape it with maximum flavor from the get-go, no messing. All Freeman vape juice is pre-steeped for three days before shipping. This is why it tastes so gosh-darn good!